Anyone who loves retro gaming might want to get their chops around Pixel Nation, a new quarterly magazine dedicated to the world of old-school digital entertainment. The first issue of the 100-page, full colour periodical includes articles on topics dear to many Nintendo hearts: famed composer Koji Kondo takes the spotlight, and the Legend of Zelda cartoon series comes in for scrutiny too. Best of all, some of your favourite Nintendo Life writers have contributed articles too: editor James Newton waxes lyrical about seminal SEGA Saturn classic NiGHTS into Dreams while Jamie O'Neill recaps the history of Out Run and Mike Mason takes a look at the resurgence of 2D platformers in recent years. The magazine is available as a PDF download for £3.99/$6.32/€4.77 or as a PDF and physical copy for £8.99/$14.25/€10.76, and can be ordered direct from Pixel Nation. The debut premier issue of the quarterly Pixel Nation Book is here! 2D Platform Revival - An in-depth look at the classic 2D Platform genre, how it faded away, and its current resurgence on modern platforms. Design Classic: NiGHTS into Dreams - Huge feature on the beautiful Sega title Nights into Dreams. This is a “Design Classic” concept, where we outline in detail a particular game, and what makes it a design classic as well as its history. Retro Icon: Outrun - Yes, we obviously love Sega, but really, all the cool kids do! A huge in-depth feature, and our regular "Retro Icon" concept, going into mega detail about the original Outrun Coin-Op and what makes it unquestionably a Retro Icon. Bob Wakelin Interview - We interview super influential 80’s British video game artist Bob Wakelin, and take a look at some of his favourite pieces of game art. Guide to Floppy Discs, the Gaming Black Market and the Far East - Yeah, we’re going there! The awesome and very knowledgeable Adam of RetroCollect joins the Pixel Nation, and gives you a wonderfully entertaining look at the various copying devices and black market shadiness from the world of retro games. Confessions of a Girl Gamer - But I thought this was a geeky boys club? No! Geeky girls play too! An excellent and thought provoking look at some of video games most iconic female characters, as written from the perspective of an actual real life girl gamer! Zelda Cartoon Feature - “Well, excuse me Princess!” We interview the two voice actors from the 1980’s Zelda cartoon, to get an insiders perspective on the show. Spotlight: Koji Kondo - A look at some of the awesome output from the Japanese video game music composer who has composed some of the most iconic game music of all time. Amiga 1200 Look Back - Who doesn’t go weak at the knees for Commodores super beast of an Amiga? This is a richly detailed look at the history behind the system and how it came to be. The Shadow of the Beast Interview - Another exclusive interview, as we talk to the man behind the Amiga classic Shadow of the Beast, Martin Edmondson, in the first of a 2 part special speaking to the people behind the games. It'll be the digital version for me, thank you. I'm glad the option is there, and it's significantly cheaper. Hmm, If Nintendo Life writers are involved then I may consider it! Are they looking for any more contributors? I'm the Staff editor for PN. We are looking for more contributors best bet is to pop over to the site and join the forums. Nothing of interest for me in issue 1, maybe #2? Interesting. & some interesting topics for a first issue. I might check it out. "It's good, too" Are you just saying that because you got to right an article? @hydeks Yes its available to everyone! We do worldwide shipping all for the same price. Random question but; You guys ever aiming for a Future or Image publishing distribution with this thing? @SkywardLink98 I want to preserve that comment for ever. Oooh! I've just receive my brand spanking new copy through the post and had a quick flip through the pages and all I can state is "WOW!" I love the A5 format, it slips so easily into my girlbag and the cover art is amazing! I do prefer original artwork over digital stock art from games! Perusing the pages, glancing through the topics and admiring the layout, it gave me a sense of wonderful nostalgia... and then I realised why. Pixel Nation could almost be the love child of the, now defunct but super awesome, UK Super Play Magazine and the primary version of the US PSM (PlayStation Magazine) before it went rubbish! These two were, and still are, my favourite magazines of all time. I still flip through old copies now and then for the artwork and articles. The pages are full of personality and humour, cram-filled with information about all things game-related in the chosen format field without bordering on ultra geekdom. It was an elitist subject magazine, without the elitist attitude! For me, I think Pixel Nation is definitely going down the right track and I look forward to seeing what topics will be covered next issue and what art will grace the cover (please keep it original! I'm forever missing Will Overton's epic original covers for Super Play Magazine and the varied cover art styles for PSM). I will be supporting you, Pixel Nation! You have garnered a fan. I hope you will be able to offer subscriptions in the future! (^_^)... for everyone else... GO BUY IT NOW! I am really excited about this publication, I have been looking forward to it for a while and it was interesting to chat with @James and @Mason about their articles at the last Nlife meet. I can't wait to read James' piece on NiGHTS into Dreams and Mike's feature on 2D platformers. I have just ordered the first issue of Pixel Nation tonight, it's cool that it includes a free PDF version, but I love print so much that I will be waiting for the book to arrive before getting stuck into these features, so I can savour flicking through its pages and relish that fresh book smell. After reading through a synopsis of its content, as listed above, I know that I will enjoy the subject matter of its retro articles. I'm proud to have been involved involved with this publication. 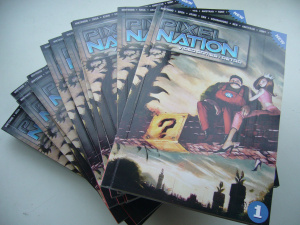 Good luck to Pixel Nation, I look forward to future editions of this book. @KAI7321 Nope, we are going to keep publishing it ourselves. We want to become a retro specialist publisher. Not just our own books but from the retro community too, that's why U-Publish is available to all. Already have a free example on there plus a couple of other authors work.